The exterior stonework was created from cottonwood limestone tailings—the waste product from manufacturing stone. Between March and May, several students cut each of the tailings down into smaller blocks. “I don’t know if they had done something bad,” Thomas jokes of the labor-intensive task. But the material and process are a good example of Studio 804’s strength—the ability to transform an otherwise useless scrap into an aesthetically pleasing material through a combination of inventiveness and cheap labor. “We imbue it with design and the sense of the hand,” Rockhill says. The glass is from Sage Glass, a manufacturer of electrochromic glass. This means that electricity is used to control the darkness of a layer of tint sandwiched between glass. Altering the amount of electrical current allows the material to change in darkness. This allows the darkness to be changed on a dynamic basis to optimize for heat loss depending on weather and time of year every minute of a day. Or by whim, with a control knob depending on the desired darkness. Unfortunately, the cost of sage glass and related electric current tinting glass is quite prohibitive, limiting the installations to mainly universities, corporations, and upscale hotels. Saint Gobain, owner of SolarGard and Bekaert brands, has a similar product called “Quantum Glass“. I would like to see these product manufacturing challenges to be solved and available for the residential market. Imagine tint that you can change depending on your mood and desire for privacy! The Sage Glass actually utilizes proprietary coatings on the glass to achieve the Electrochromic process – NOT a laminated film. The amount of electricity used to tint the glass is very low – 200 Sq./Ft of Sage Glass uses approximately the same voltage as a 60 watt light bulb. The relative cost for Sage Glass is NOT prohibitive. 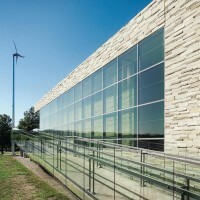 When taking into consideration the cost of the other mechanical architectural elements used to try to control the solar heat gain and glare, such as exterior louvers, motorized blinds, shades, blinds, etc., the initial first cost of Sage is actually less expensive than a standard low-e glass in many cases. This is just the “first” initial construction cost and does not take into consideration the short and long term energy savings associated with Dynamic Glass which allows a building owner to control the degree of natural Day-lighting and heat gain depending on the needs and conditions. Correction: The below comment should have read 2000 Sq/Ft.